Do you remember a few weeks ago when we posted our lovely new year cards? 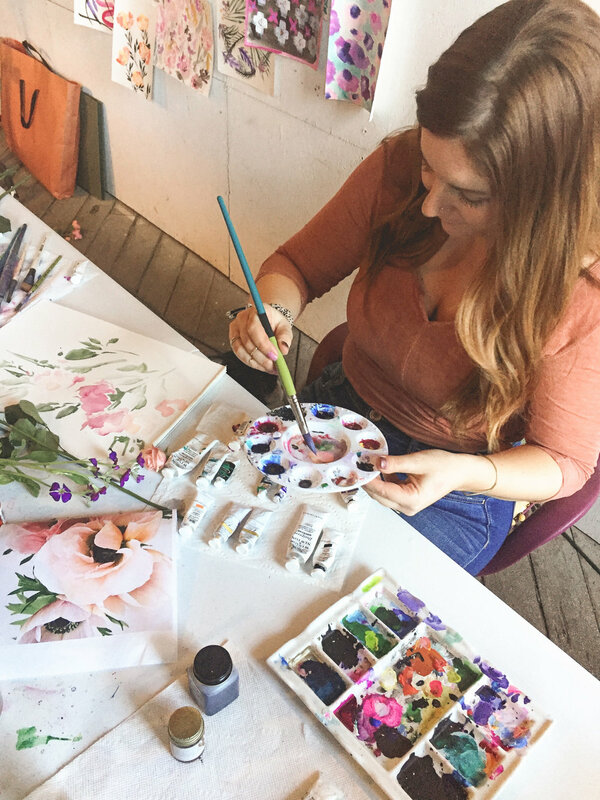 Well, today we wanted to share more about the artist who created the watercolor artwork for it, and some behind the scenes of our collaboration with her. We have been hard at work creating some new wedding suites for our brides, and we can't wait to share it all with you in the upcoming weeks. Today, we are going to show you our first sneak peek at what all has been happening here in the studio. When we began brainstorming these new suites, we knew we wanted to reach out to other local artists to create a more diverse collection that allowed our brides to have the opportunity to mix and match their favorite elements. Que Reed, an amazingly talented designer, and watercolor artist. We are going to dive right on in with a Q&A and talk about her background, process, and her favorite pieces from our collaboration. How long ago did you begin creating your artwork? I’ve been painting since I was about 8, but I didn’t realize I wanted to pursue art seriously or for any real purpose until I was in high school and I was creating Georgia O Keefe replicas “for fun” haha. Since then it has been a journey to find and define my style and process. It wasn’t until I attended The Creative Circus(advertising school) post-college that I even figured out there was such thing as a “textile designer." That is when the light bulb went on and I began branching out into pattern design and learning about other ways I could use and sell my art. What time of day do you feel the most creative? If you are not feeling creative, what is your #1 way to get into your groove? Get outside! I take a walk or find something that inspires me in nature. Usually, it’s a beautiful flower or plant with some cool pattern that gets my brain thinking. Or often times it could be the architecture of an old building or a random tile pattern at a local coffee shop. Getting out of your element generally always does the trick. Pinterest. I spend A LOT of time on here and have a million boards. It’s my favorite way to quickly be inspired by anything and everything - plus it's fun! - from room decor to runway fashion to typography…I never know what will give me an idea. How do you start a piece of artwork? Before I begin any piece I usually do an abstract color warm-up or floral exercise to help loosen up. 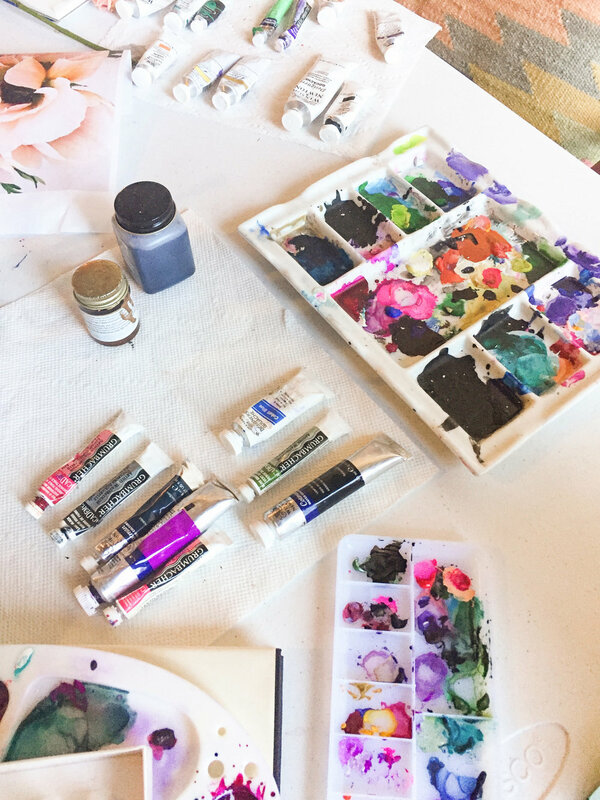 I also like to have an inspirational picture or flower in front of me to refer to while I’m painting, so I make sure to organize and gather all essential materials and ideas before I begin. What are your favorite paints to use? Currently, I use a mix of India Ink and Gouache paints and some watercolor. Occasionally, I will also use goldleaf paint and gold sharpie for highlighting purposes once the piece is complete. What is your favorite part the process? I love picking out my color palettes and trying to spontaneously match new colors together on the spot - sometimes it works and sometimes it doesn’t - which is the thrill of it. I also love post work in Photoshop. This is where the magic happens. I can edit all my colors and really transform my painting into multiple patterns. What are your favorite subjects of your artwork? All floral, all the time! haha. If it's not flowers or botanicals it’s abstract shapes or geometrics. Most recently I have started to play around with incorporating more fauna into my botanical patterns. I'm open to any subject, but I'm usually drawn towards nature. What colors are your favorite to work with? I'm passionate about all colors….but using a rich black in my work is a MUST. Other than you can almost always find shades of peach, lavender, blush and turquoise in my work. When we first sat down with Reed to discuss a collaboration, we all had so much inspiration pulled. We stalked her Instagram and discussed color pallets and styles we wanted to explore. "Definitely the patterns on black. I fell in love with painting on black watercolor paper! Painting on black gives it a completely different dimension and a rich bohemian feeling that I can’t recreate anywhere else." So here is a sneak peek into our new line of envelope liners created by Reed. We hoped you enjoyed a glimps of our collaboration and the new line of envelope liners. We can't wait to see which ones become our brides' favorites. Thanks for following along with us. Here is a recap from Reed and her side of our collaboration. We love being able to collaborate with local artists and are looking forward to sharing more about our collaborations in the future. "Collaborating with The Impressionist and Alee & Press is always such a positive and liberating experience. I get to create work that represents me 100% and I’ve found that I do some of my best work with her and her team. We understand each other's styles well and our mutual love of design and color always makes collaboration a super rewarding experience! This past collab specifically challenged my color palette toolbox to feature neutral colors - I’m used to choosing bright, tropical colors; so creating patterns with a muted color approach for weddings was slightly difficult at first. Now I have whole new series of go-to color options that totally diversify my patterns - I couldn’t be happier."